The visit I’m writing about took place on December 22nd of 2018. I’d been to Giesenbräu many times prior but it was too busy or too near last call to get what I needed for a review. 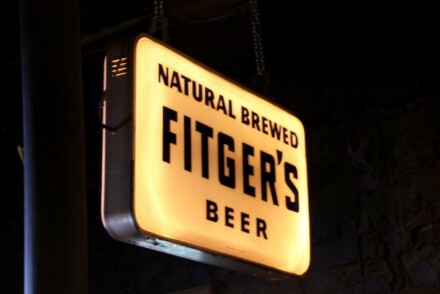 Since it was my hometown brewery I wanted to get a good feel for the place before writing a blog post. 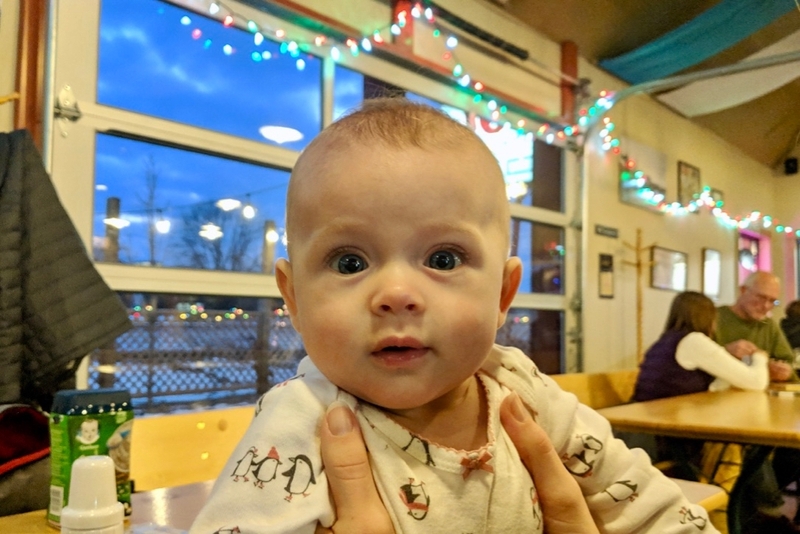 When I mentioned to my mother and father that we were in town and would like to meet them at the brewery they jumped at the chance to see their new granddaughter before Christmas. Certainly my dad would never turn down a beer! 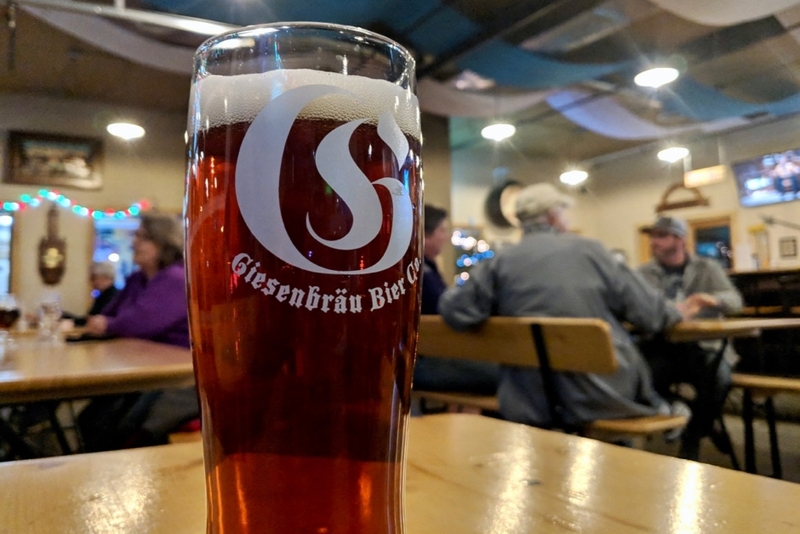 Locals know Giesenbräu as the brewery located in the old appliance store next to Ace Hardware. Inside it’s barely recognizable. 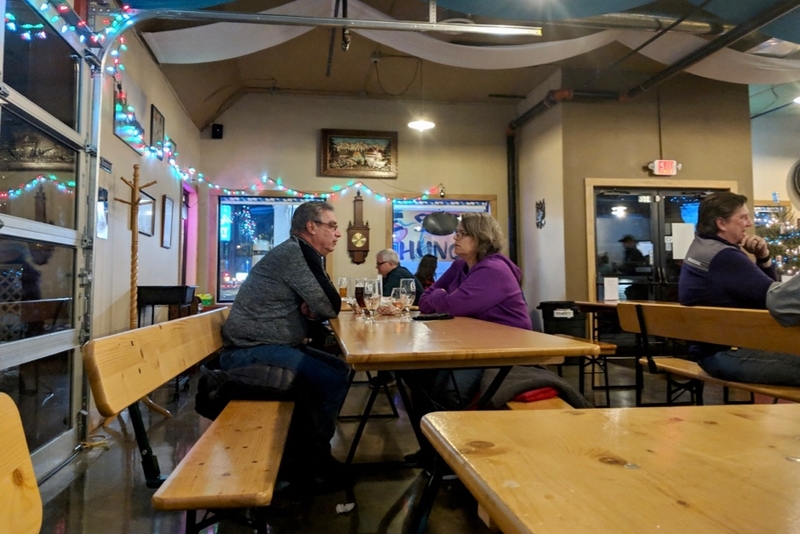 The owners took their German inspiration and transformed the interior into a beer hall complete with tables and benches that would be at home in a Bavarian biergarten! One feature they owe to the city is their long wooden bar. It was originally located at one of the old bars in town and had been stored in the basement of city hall for many years. 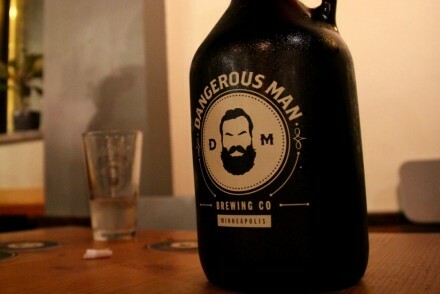 It was obtained by Giesenbräu and is now prominently displayed on one side of their taproom. They truly do not make bars like this anymore, or at least they don’t without considerable cost. When they first opened I heard two things. 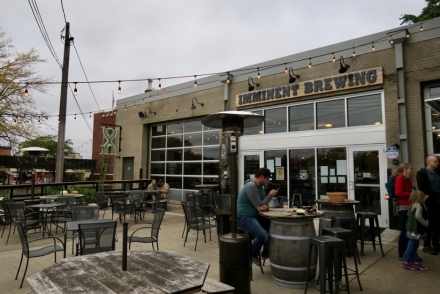 The first was that they were going to draw crowds away from the bars in town, and the second was that they weren’t going to get enough business because the town was too small. Those opinions are on two opposite ends of the spectrum but my thoughts on both remain the same. 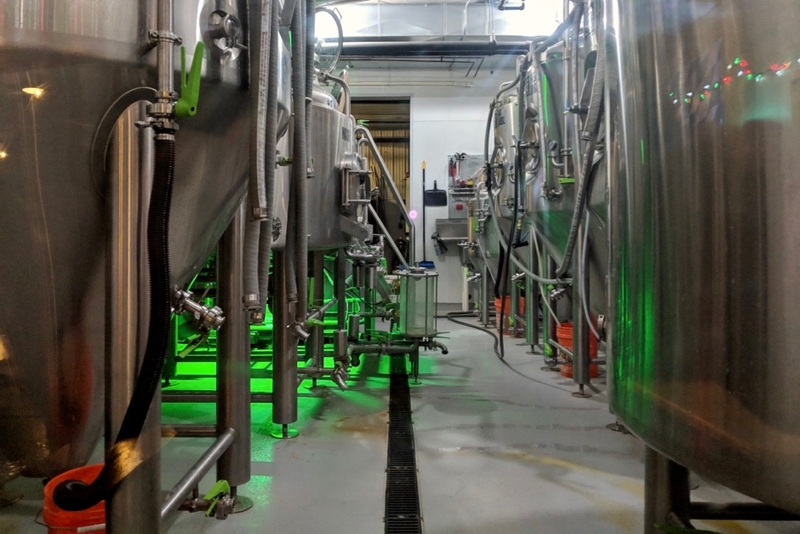 The crowd at most breweries is completely different than the crowd you’d find at a town bar. They’re going to draw more families, an older generation, and people that want to enjoy an adult beverage without the stigma and atmosphere at a bar. 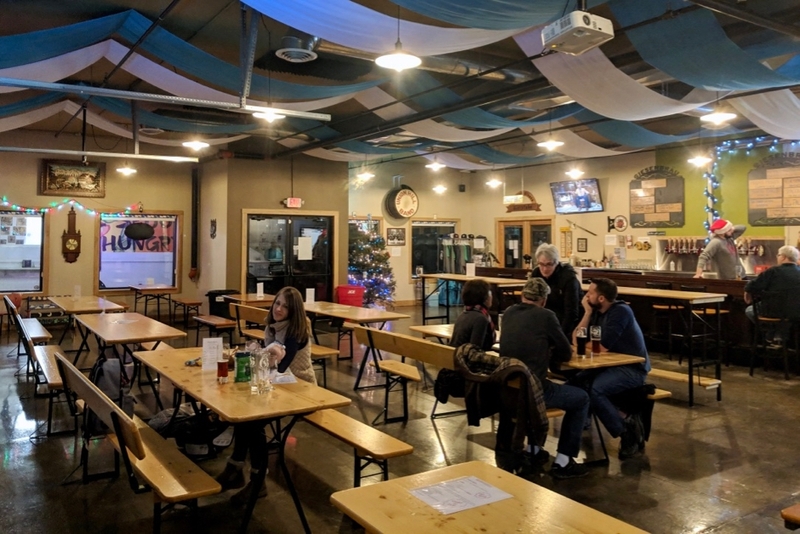 I firmly believe that any town New Prague’s size, and even smaller, can support a craft brewery. At this point I feel vindicated on the subject since every time I visit on a weekend they’ve been packed with a crowd I would definitely not see at the bars. They are open every day of the week and have food trucks on Thursday, Friday, and Saturday. The trucks add an additional wrinkle that I hadn’t even considered. For most of my life there has only been a handful of restaurants in town and a couple of locations have been a revolving door. Food trucks draw in people just by their very nature and I’ve even visited when people have been there for the food alone! Since our visit was three days before Christmas it was fairly empty. It was the primary reason that I chose that to take my photos and write my notes since there was no crowds to get in the way. The decor is mixed between Bavarian and local odds and ends. There is a Union Hill drum on the wall (another even smaller town), blue and white Bavarian banners strung from the rafters, and a handful of photos and signs that bridge the gap between local Czech history and German inspiration. There is one glass garage door that opens onto their small patio which contains a playground for little tykes. What about the beer? While they are inspired by German styles they don’t let that limit their possibilities. I’ve had Doppelbocks, Hefeweizens, Lagers, Stouts, Pale Ales, IPAs, Double IPAs, Irish Red Ales, Brown Ales, and many more. During our last visit they had seven beers on tap. I had three. That Other Wizard the Brown Ale, Blueberry Lemmiwinks Berlinerweisse, and Hop Quality H20 IPA. My favorite time and time again is That Other Wizard. I believe the name is a nod to either Radagast or one of the other Brown Wizards of the Lord of the Rings. It’s smooth and malty with just enough hop bitterness to round things out. I order it every time it’s on tap! It was the quietest night at Giesenbräu that I’ve experienced. 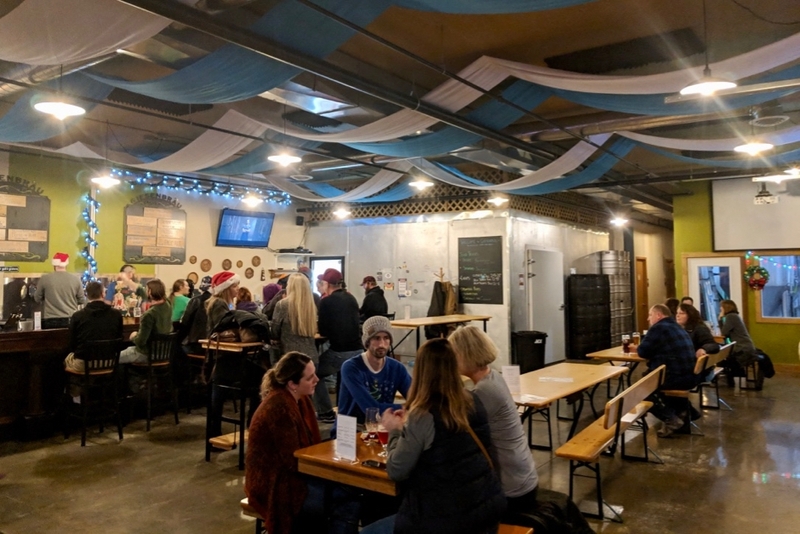 Halfway through our visit, Santa Claus showed up and bounced between everyone in the taproom. That’s the sort of the thing that a place like this promotes and perfectly captured the close knit feel of a small town. There are few nights I don’t see the owner behind the bar and many times I see him in his full tracht (traditional Bavarian clothes) topped by his Tyrolean hat covered in pins. He’s definitely having a good time running the brewery and, if you haven’t already, I’d recommend joining him!